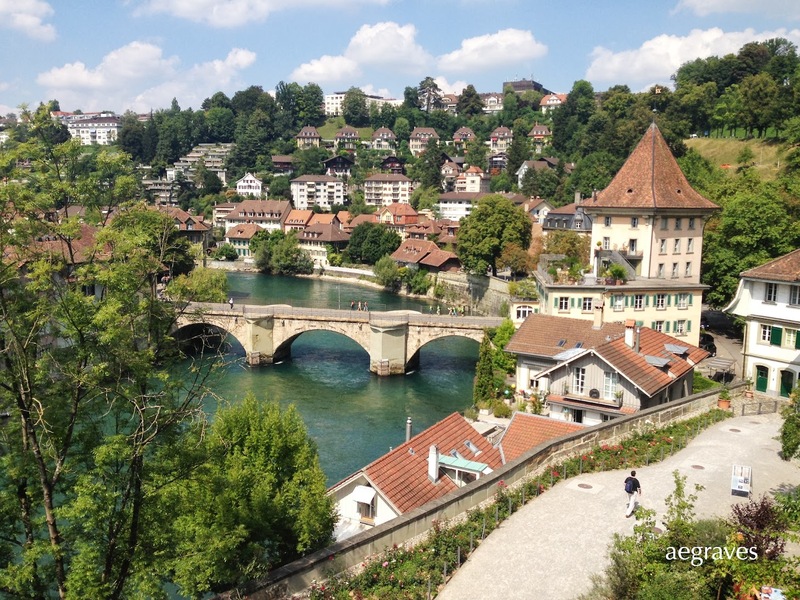 (For additional images of Bern, visit my Google album, "2013.08 Bern, Switzerland"). My first business trip to Switzerland was unexpectedly extended from two to three weeks, meaning that I had one weekend to (a) recover from the shock of being in Switzerland at +nine hours to my home schedule and (b) struggle to remember German, especially since the Swiss have many of their own versions of that language, and then (c) had one weekend left to take a day trip to see some of Switzerland beyond Basel. I preferred doing that over fretting about running out of laundry, since I'd only packed for two weeks. I'm not one of those people who had the money to take a year off after college to explore Europe, - heck, I had to take time off FROM college to earn money to finish college! Europe was out of the question in my youth, and even for years after I finished my degree, while I was working full time to pay back my student loans and get myself established. I'd been to Paris around 2003ish, and had visited Sweden for the first time in Spring of 2013, but otherwise Europe had been remote to me. My first Swiss business trip promised to change that. So, there was no way that I could miss out on seeing at least some of Switzerland during a weekend day off when it was all so CLOSE. Bern is the capital of Switzerland, and its old town center is a UNESCO World Heritage Site. Bern is also relatively close to Basel by train, and I hadn't yet gotten the scale of Switzerland down yet. (I'm from California, a ridiculously large U.S. state, and so I am cautious about even committing to go across my state width-wise.) Also, it gave me a chance to use the excellent-looking City Guide Bern from myswitzerland.com, which quickly established itself as my go-to resource for Swiss travel information. They even have iPhone apps with walking tours and highlights of most of the cities I planned to visit! Myswitzerland.com sold me on Bern, and so I purchased my train ticket and went out to explore Switzerland's capital. The Swiss obsession with clocks was already beginning to affect me before I arrived in Bern, but the impressive faces of the Zytglogge (both its conventional and astronomical clock faces) and the long symphony of bells that rang out all over town upon each afternoon hour were delightful. Bells aren't rung in Switzerland American-style: it isn't *just* a few gongs to mark the time. First, there is the warning bell to get your attention; then, the announcement of the time; THEN, as if the bells needed a warm up, the bells just go and go, as if trying to drown out all of the OTHER bells that may have started their own sequence a few seconds later. It's quite celebratory, to hear so many going at once. It's what you'd expect if your team was winning at the Olympics, yet every afternoon of celebratory bells feels like a special occasion. Old town Bern is quite walkable. The app's walking tour took me past many interesting fountains (always with potable water) to the historic town hall, to a hotel's lovely restaurant for a very satisfying lunch, past the medieval arcades (which contain a mixture of nice shops and excessively touristy ones), and across the sparklingly clear Aare to enjoy amazing views of the sharp bend in the emerald river. A walk uphill, away from the (rather depressing) bear park, took me to the town's Rose Garden, which is a pleasant place to enjoy views looking down on the town center and its maze of rooflines. The garden was filled with locals, relaxing in the sun, plus a large wedding party. I continued through the suburbs, looking at the different styles of houses along the ridge's edge as it followed its course, and visited a contemporary art museum, Kunsthalle Bern (kunsthalle-bern.ch), where I enjoyed both the exhibited work AND the impressive freight elevator which is hidden in a gallery floor. The river was too beautiful and clear not to examine more closely. I descended many flights of stairs from the Kunsthalle to multi-use paths along the river, where I watched locals get relief from the heat by floating down the river from one designated entry point to the designated exit - yes, there were traffic signs, directing bathers out! I returned to the stairwell, climbed back up to the level of the tall bridges near parliament, and enjoyed a casual dinner and the view from the patio behind the cathedral. On the way back to the train station, passing the tower that had been used as a jail for women who had affairs with priests (while wondering where the jail was for priests who had affairs with women) (and no, there isn't one), I took in a view of the parliament building which I would later recognize in a big-budget international thriller. If only I had a Wickelfisch (a sort of dry bag popular in Basel) and swimsuit with me, I would have joined the many happy families of bathers in their relaxing, cooling downriver floating. It was a gorgeous day, and it would have been a PERFECT afternoon to do that. I will be better prepared if I return there in summer! Bern was a pleasant choice for a "model" Swiss city. The town is charming and scenic, and my visit proved that the website I was using provided GREAT information for independent weekend exploration. Old Town Bern felt a bit sleepy during my weekend visit, but this seemed to be caused by having most of the population playing in the river during the day's heat. It did feel smaller than Basel, thanks to the isolation of the old town on its river peninsula: in reality, the city spread beyond the trees lining the river valley. The main points of interest were all easily accessible, and I was lucky enough to enjoy pleasant weather. It also gave me the courage to plan a trip to Zürich.